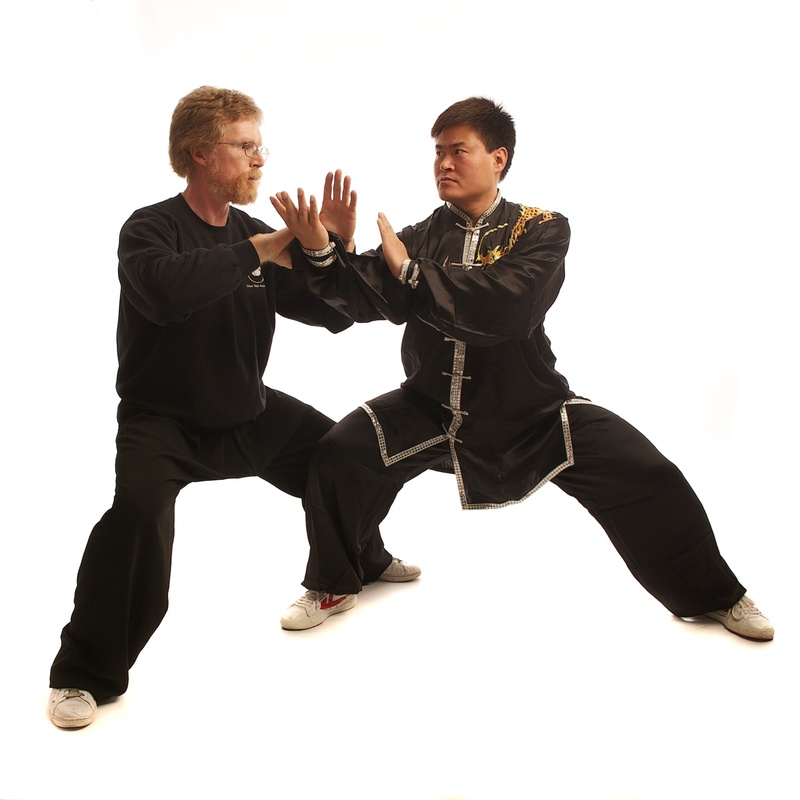 The basic skills needed for taijiquan push hands are developed in the foundation form. These are loosening the body (song,) the fundamental skill of taijiquan peng jing, uprightness (ding), rootedness (chen) and silk reeling motion (chan su jing) along with the basic directional jings, peng, lu, ji and an. Additionally the skills of sticking (nien) and listening (ting) are required. n.b. Please note that the character peng has two meanings, (one is the fundamental skill of taijiquan and the other is the upwards skill/strength,) while the word ding is the sound of two different characters, one for listening and one for uprightness. The basic process is for one partner to apply strength, while the other sticks, follows and neutralises (hua jing): Neither too little (bu diu) which results in collapsing, breaking away and not sticking, nor to much (bu ding) which results in opposing or resisting my partner. The correct path is found through the development of peng jing. a. Single hand exercises: includes three types (vertical circle, horizontal circle & figure 8), with left & right side, forward and reverse combinations, giving 12 exercises in total. These are a non-competitive set of exercises. The initial training purpose is for one partner to practice pushing while the other partner practices sticking. The pressure should be constant not varying. When their sticking is maintained evenly then they should practice stretching lightly towards their partner to maintain peng jing. The partner uses the waist and contraction of their whole body to follow their partner. When pushing use the leg and waist & not the shoulder. with the push moving in a half-circle. Other single hand exercises can be devised from the double hands exercises, practicing a single hand motion where a student is having difficulty making a change to the correct type of motion. These can initially be practiced with one partner sticking with light pressure while the other partner practices shifting forwards and backwards without turning. The emphasis is initially on practicing winding (opening and closing) to the fingertips. Then figure 8 waist turning can be incorporated. Then students may advance to keeping peng jing present continually relatively quickly if their understanding of this has been trained into their body through practicing loosening and stretching during foundation form practice. Two types of exercises each with combinations of left leg or right leg forward, left hand or right hand forward giving a total of 8 exercises. The legs remain fixed hence the name. practiced responding to a push by neutralising down then lu forwards. The other type is practiced responding to a push by neutralising up then with lu backwards. Usually the same leg of each partner is forward e.g. both partners have their right leg forward, with the feet about 30cm apart. Ding Bu push hands can be practiced with one partner having their right leg forward and the other partner having their left leg forward so the two players legs or on the same side, one inside the other, about 10cm apart. This combination can be reserved for Hua Bu, the third type of push hands. Initially the basic exercise pattern needs to be learned and practiced, preferably with a variety of partners. The pressure is kept light. Emphasis is on using the waist and legs, not the shoulders. Subsequently this practice can be used to understand more fully the interactions of these four jings and the idea of the correct type of neutralisation: not meeting an attacking jing head on but with a rotating / spiralling motion coming from the body, initially following the attacking jing. he place to gain these skills. Rather, it is a practice that reveals the lack of these skills. The skills themselves are a consequence of correct and lengthy practice of the foundation form. With time and correct practice peng jing is developed and increased. The aim is to have peng jing where ever my partner touches me. With more time, corrections and practice I learn how to listen to my partner’s body, their peng jing or lack of peng jing, through my own peng jing. In this respect push hands can very directly be seen as the development of the use of peng jing. Without it there really is neither push hands nor taijiquan. The initial emphasis is to maintain sticking (nien), peng jing and ding jing - the ability to listen to my partner. Subsequently the pattern of attacks and neutralises can be used to explore a partners weaknesses and the opportunities they present. This involves the development of cai, lie, zhou & kao. 3. Hua Bu is the next degree of difficulty added, i.e. a single step is added. 2 types of exercises, left leg stepping forwards and backwards or right leg stepping forwards and backwards. In each combination only one leg is moved forwards and backwards i.e. right leg or the left leg. One partner moves their right leg, the other their left leg. The rear leg is moved to step forwards and the front leg to step backwards. The partner with the leg on the inside steps backwards. These exercises are similar to Ding Bu above, but with one partner having their right leg forward and the other partner having their left leg forward so the two players legs or on the same side, one inside the other, about 10cm apart. Again the initial emphasis is to maintain sticking (nien), peng jing and ding jing - the ability to listen to my partner through out the stepping process. Subsequently the pattern of attacks and neutralises can be used to explore a partners weaknesses and opportunities they present. Initially it is done co-operatively until both partners can maintain their peng. Then the exercise can be developed similarly to that of Hua Bu, exploring a partner’s weaknesses and exploring the utilising of cai, lie, zhou & kao.It includes 2 types of exercises, left leg stepping forwards or right leg stepping forwards. The increased difficulty is specifically lengthening the step and using a lower stance. It requires greater leg strength and greater looseness in the hips. Where this causes difficulty is can felt by the other partner in the loss of peng jing. There are several variations and intermediations but all revolve around the basic Hua Bu pattern. 5. Luang Cai Hua includes many varieties of motion which effectively utilise stepping around or pulling a partner with stepping. In the ARTICLES section of this website there are many references to push hands. There is also a transcript of a discussion in which Wang Hai Jun participated and his comments on Push Hands which can be found here. Nick Gudge is a student of Wang Hai Jun and teaches Chen style taijiquan (tai chi) in Limerick.